When a customizer like BRABUS "tunes" a car, we expect more power, better handling, unfortunate chintzy gadgets and gimmicky styling. In the case of the BRABUS-tuned Tesla Roadster, a car they claim is the first ever tuned electric car, it's just the chintzy gadgets and gimmicky styling. 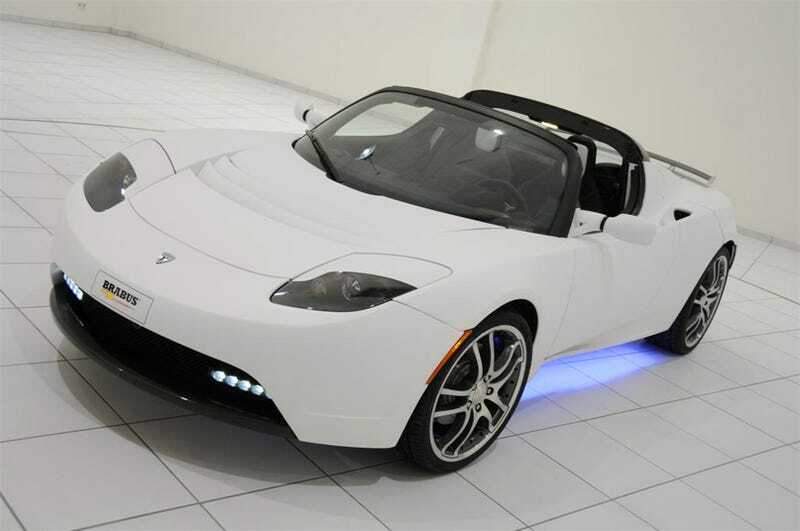 The German tuner shop may be the first to take on the Tesla Roadster, but with no added power, no added acceleration and no changes to the suspension, we're unfortunately left with merely taking in the breathtaking addition of a "space sound generator." That's right, press the pedal and instead of a quiet whoosh of power, you get a simulated V8, simulated race car, and "two futuristic soundscapes named ‘Beam’ and ‘Warp.'" What? Yes, seriously. Hit the jump for more. Add to the spacey sound track a truly silly marketing line of "space lights" known to the rest of the world as "under body neon," a classy lightning bolt logo below a yet even classier rear spoiler on the back, new leather interior and leather floors and you have a vehicle truly fit for Captain Kirk.